My white calla lilies from last year produced yellow calla lilies this year. Is that possible? The white ones were planted along with a salmon colored one in the same pot last year. I removed them in fall, washed them, let them dry, and put them in in basement during winter..I live in zone 4. This year, I planted them and currently I have 6 coming up in the same pot and they are all yellow. You may have had a pot of mixed bulbs from the start. They are often planted and forced this way in the greenhouses. They may have not bloomed the first season but now are making an appearance. We commonly have this question and experience a few times a year from gardeners. Enjoy them! Love the bucket! 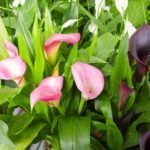 Here is a link with more information on Calla Lilies.